And here's what I created with these supplies! And now I'll take you through the steps I took to make this little panel. I've been cleaning out and reorganizing my craft room for the last month and a half - and donated a lot of my excess to my church for their yard sale in June. And one of the things I got rid of was all of my coasters that have been languishing in a drawer for years! Never fear! 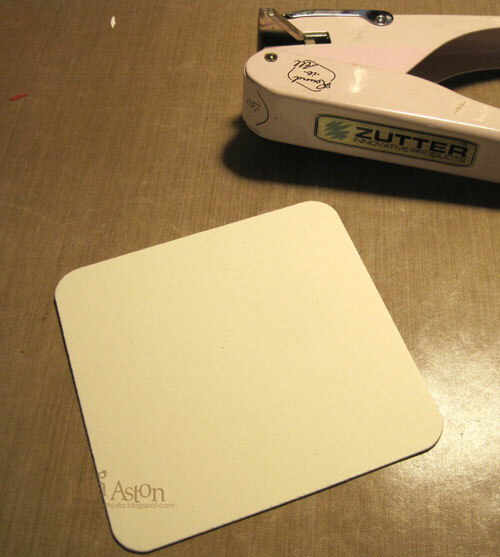 I just made my own coaster by cutting a piece of mat board 4" x 4" and curving the edges with my Zutter Corner Rounder! 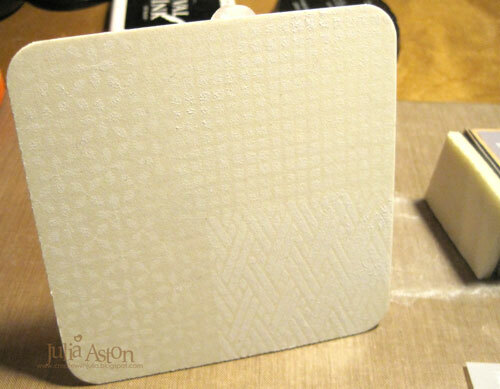 So here's my substrate - a coaster! For my resist technique - I stenciled over my coaster using 3 different Tim Holtz mini stencils applying white acrylic paint through the stencils using a foam applicator. 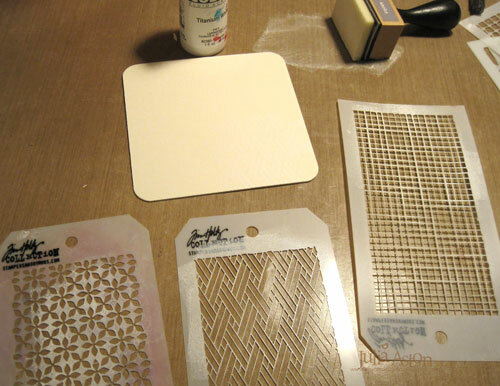 Wash your stencils immediately after sponging with paint - it dries really quickly! Here you can see the result of the stenciling with the paint. Now to add the orange color. I rubbed 3 colors of Ranger Distress Oxide Inks - Spiced Marmalade, Fossilized Amber and Walnut Stain onto my craft mat and spritzed with water. 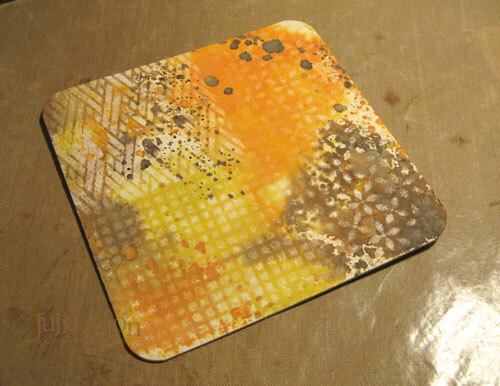 I kept pressing the coaster into the inks until I was satisfied with the colors and the look of it. The wetter it is, the more it blends - the less wet it is you get the look of droplets. Then I got out some items I thought I'd like to put onto my project. I added a Quote Chip along the top that I sponged in Ranger Distress Marmalade Ink. I added butterflies and a vintage poster from Layers/Botanical. I also added some Remnant Rubs/Botanical and Small Talk Stickers. To finish off my project I added some orange rhinestones and propped it up on a little wooden easel! Thank you for stopping by Terminal #3 at A Vintage Journey today - I hope I have inspired you with my creation using the contents of my travel bag. 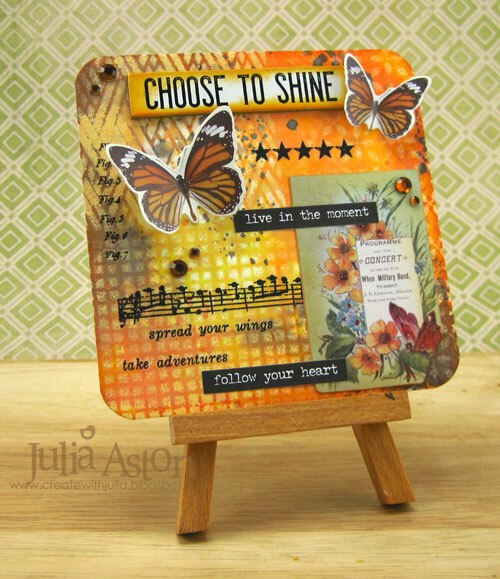 We hope you are able to stop by again next Monday when there will be a new Destination Inspiration post by another of the Creative Guides using the same supplies! I'd also like to remind you there is still time to join in on our June monthly challenge, "Use a Canvas" which will run until July 6th. You will find the link and all the challenge details here. 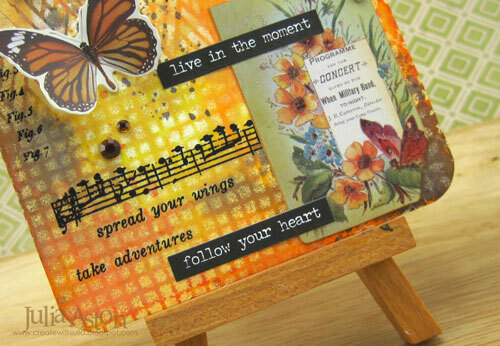 Accessories: Idea-ology Layers/Botanical, Quote Chips, Remnant Rubs/Botanical, Small Talk Stickers, rhinestones - Kaiser Craft, Zutter Corner Rounder, wooden easel - Joann, white acrylic paint, foam sponge, 3 mini stencils - Tim Holtz. Such an uplifting feel-good atmosphere to this, Julia. Even though I usually avoid orange, I absolutely love it! This is such a wonderful project Julia! To be honest, orange is usually my least favourite colour, but the way you used it here with the stencilling and in combination with the browns and the deep read of the botanical image, it just gives a really up-lifting summery feel! What a wonderful use of a coaster, I really love this! 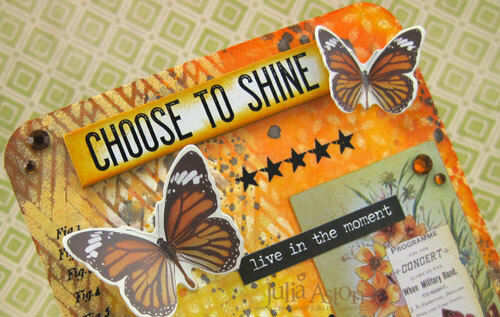 Gorgeous summery project, love the background and colours.